Researchers from Cedars-Sinai Medical Center in Los Angeles, published a study in which 29 adults who received a 45-minute Swedish massage had an increased number of lymphocytes and lower levels of cytokines (molecules that play a role in inflammation) decreased levels of cortisol. Even if you are not used to having massages, when you feel too tense try a Swedish massage. It’s not deep tissue massage, as some people think. There are some similarities but the pressure, technique, intended use and areas of focus make Swedish and deep tissue different from each other. Swedish massage is the most common type, sometimes called a classic massage. It is gentle and suited for people interested in relaxation and tension relief. It loosens up tight muscles caused by daily activities such as sitting at the computer or exercising and can be very helpful for people who hold a lot of tension in their lower back, shoulders or neck. The 2013 study “Effect of a Single Finnish Sauna Session on White Blood Cell Profile and Cortisol Levels in Athletes and Non-Athletes” by Wanda Pilch and team, evaluated 9 trained middle-distance runners and 9 male non-athletes. The subjects from both groups participated in 15-minute sauna sessions until their core temperature rose by 1.2°C (mean temperature in the sauna room was 96° ± 2°C; relative humidity was 15 ± 3%) followed by a 2 minute cool down with water at a temperature of 19–20°C. The results showed an increased number of white blood cells, lymphocyte, neutrophil and basophil counts was reported in the white blood cell profile. Higher increments in leukocyte and monocyte after the sauna bathing session were recorded in the group of athletes compared to untrained subjects. Conclusion: sauna are good for everybody, and the best for athletes. Frankincense oil, lemon oil, eucalyptus oil – these are some of the most recommended essential oils to boost immunity. However, keep in mind that their quality is (also) essential. Don’t buy them from everywhere. Usually the best products are sold in MLM business pattern (multi-level marketing). I personally recommend doTERRA products, which I’ve recently found on Amazon as well: Frankincense, On Guard (a special blend) or Breathe (a respiratory blend). Their price is huge compared to other brands, but believe me, so is their quality. Don’t buy the cheap ones as you would simply waist your money, and worse, lose trust in essential oils. DoTERRA also teaches you how to apply them on your body, which is not difficult. But you can also use a diffuser , the best choice for prevention and aroma in the house. “Mindfulness meditation and the immune system: a systematic review of randomized controlled trials” – a study done in 2016 by David S. Black and his team, included data from 1602 participants and revealed tentative evidence that mindfulness meditation is associated with changes in select biomarkers of immune system activity. The scientists identified mindfulness mediation-related effects for the following four parameters: reductions in the activity of the cellular transcription factor NF-kB, reductions in circulating levels of CRP, increases in CD4+ T cell count (in HIV-diagnosed individuals), and increases in telomerase activity. And unchanged levels in antibodies and interleukins. Conclusion: mindfulness mediation appears to be associated with reductions in pro-inflammatory processes, increases in cell-mediated defense parameters and increases in enzyme activity that guards against cell aging. We are more and more told that we are energy. While this is rather hard to accept, because we only believe what we see, and looking at our bodies we see solid matter, we also know that we function with energy. Like a machine. Think of how doctors use electricity to resuscitate a person. The voltages can range from 200 to 1,700 volts. What other evidence do we need to accept that we function on energy? If we break down a cell to its smallest components to the quark level, all we are left with is energy and this is what drives our biology. At the smallest level of a cell, there is empty space teeming with energy. Our nerves, brain and heart emit voltage which can be measured with every day medical equipment such as the electroencephalogram and electrocardiogram. So, why not address the base of our bodies, the energetic level. The Earth emits an electromagnetic frequency of 8Hz (Shumann Resonance). It was determined that prominent and successful healers also emit an electromagnetic frequency of 8Hz. Martial artists, saints, sages and healers have known for thousands of years that developing a grounded connection to the earth is good for health, healing and balancing. Dr. Nogier discovered that illness and dis-ease result when cells, molecules or particles of matter are out of their normal resonance or vibratory pattern. Through repeatedly exposing damaged tissue to the normal resonance frequencies associated with that tissue he discovered that healing often occurs, sometimes very rapidly. Now we have healers that work with frequency medicine or quantum medicine. There are FDA approved lasers with Frequency Medicine Capabilities, available on the market ready to be used in the comfort of our homes. Or, we can learn to work with our body’s energy using Qigong, a type of Chinese psychosomatic exercise that integrates meditation, slow physical movements, and breathing. Scientific studies have shown that after just one month of practicing Qigong daily for half an hour, the immune system has been enhanced. Here is a study from 2004, that analyzed the effects of a qigong program on various immunological parameters. The results showed statistically significant differences between the control and experimental groups, with the experimental group showing lower numbers of total leukocytes and eosinophils, number and percentage of monocytes, as well as complement C3 concentration. Other study examined the influence of Qigongtraining on depression, anxiety and stress and concluded that the practice of Qigong improves psychological states and mucosal immunity. The word Qigong literally means life energy cultivation and therefore the practitioner learns to harness and direct the wellspring of energy that he inherited at birth. Qigong is one of those practices that looks very simple, but once practiced consistently it can deliver very powerful results. A study from 2014 conducted by Giselle Soares Passos from Universidade Federal de Goiás, Brazil, evaluate the effects of moderate aerobic exercise training on sleep, depression, cortisol, and markers of immune function in patients with chronic primary insomnia. The results showed that long-term moderate aerobic exercise training improves sleep, reduced depression and cortisol, and promoted significant changes in immunologic variables. There are more studies showing the same good effects of exercise on the immune system. Moderate exercise, including long walks in the open air, not sport performance. 17. Keep a clean environment. – change your mattress every 5 to 10 years, whether it is made of springs or foam. Or, even better, buy a good organic one. Medical experts recommend looking for memory foam with a density of 3 pounds per cubic foot or greater, and coils with a gauge of 13 to 15. Learn here how to choose a good mattress. Keep in mind that price is correlated to quality. A recent New York Times test of 20 foam mattresses suggested models in the $1,000 range and over were of higher quality than those costing less than that. Here, King Mattress, is a good choice, for a lot less than $1,000. The reviews spoke for its quality. – replace chemical cleaning solutions with organic ones (as much as possible). Don’t think they are less efficient or more expensive, they really are not, and the benefits for our health are visible. Here is an example found on Amazon. 18. Work on a schedule, make a to do list and check it. Action and discipline are the most important factors that lead to success. Accomplishing certain targets offers satisfaction and self-trust with a direct implication over our immune system. It becomes strong because we raised ourselves to the level of our expectations. There is nothing more poisoning than blaming oneself for a long time. If you are the enemy of yourself, than so will be your immune system, which will start attacking your own body, just like your spirit does. It has been recently researched that our physical body directly responds and copies our states of mind and moods. Depression is linked to inflammation, but nobody knows which of the two triggers the other. You need to extend the level of compassion over yourself, more than over the others. How to do this? Understanding that whatever you did, you didn’t do it to harm anybody, and that you actually did the best you could do in that situation. That after 10 minutes, an hour or an year, you considered that you should have acted in a different way, it is not relevant. In that specific moment, you did your best. And this should be enough to understand yourself and stop self-criticism. While our scientists still struggle to understand the source of the autoimmune diseases, spiritualists say our body copies our spirit and if we attack ourselves so will our immune system. Be kind to yourself and while learning to understand and love people around you, do this with yourself first. The immune system is a delicate problem when it comes to our children. When they are young their immunity is not yet matured, which is why they catch colds very often. But this is not a bad thing, as the immune system needs to enter in contact with germs and viruses in order to enlarge its database. But sometimes things look odd. Too many colds or other diseases, too sudden, too without an obvious cause – could mean something else. Children are strongly connected to their parents, mothers in particular. Their energetic link sometimes remains till adulthood. Children feel a mother’s state of mind, no matter if this sounds mumbo-jumbo or not. Her feelings, her energy is transferred to the child, and his body will turn it into a disease. It has a close relation to karma – as we know it. This is the opinion of a popular Russian healer, with thousands of healings based on his karma-related therapies. Amazon sells some of his books, translated in many languages. Here is one to start with, at only $7.45 in kindle format. After reading it you’ll know if you want to read the rest. I personally guide myself after the idea “what if he’s right?”, read and then judge for myself. The book is worth reading anyway. Having colds in the cold season is a normal situation, it does not mean you have a weak immune system. From these colds our body actions and learns. It needs them from time to time. It is considered normal to have 5 cold episodes per year per adult and 10 to 12 episodes per child. I personally consider 12 to be a lot, though I have never counted them. But if medical doctors say so, who am I to disagree? Anyway, don’t panic if your child has caught a cold in the kindergarten. Do not try to immediately boost his immunity as there is nothing wrong with it. Vit C and D3 are just enough. Use natural remedies to ease his symptoms, like honey, propolis, teas, massages and essential oils. Other than that, remember to exclude the psychological cause, solve your (as a parent) problems, show him love and make him laugh. His own immune system knows how to convert all these into health. I hope some of these approaches will resonate with you and help you on the long run. If you know others that have a direct effect on our immunity, please let us know in a comment below. How to boost the immune system naturally. 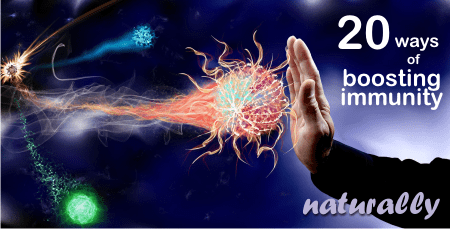 Part 1 How to boost the immune system fast? Try propolis!